Around 2500 years ago a thirty-five-year-old man named Siddhartha had a mystical insight under a peepul tree in north-eastern India, in a place now revered as Bodhgaya. Today, more than 300 million people across the globe consider themselves beneficiaries of Gautama Buddha's insight, and believe that it has irrevocably marked their spiritual commitment and identity. Who was this man who still remains such a vital figure for the modern-day questor? How did he arrive at the realization that 'suffering alone exists, but none who suffer; the deed there is, but no doer thereof; Nirvana there is, but no one seeking it; the Path there is, but none who travel it'? 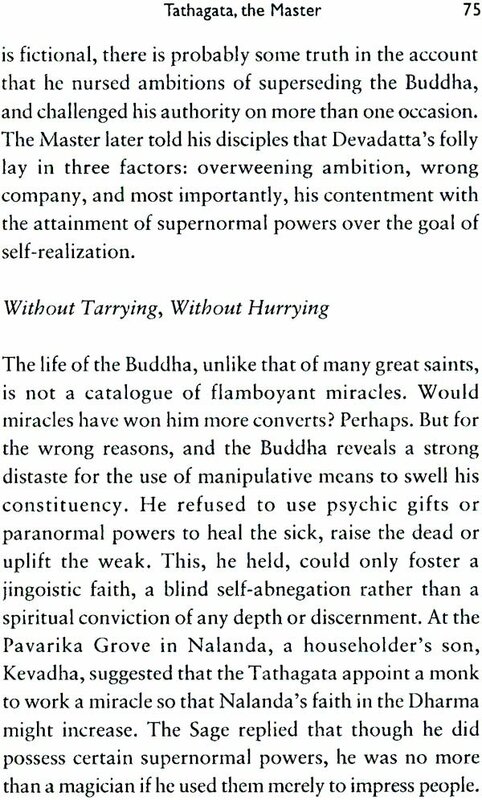 The Book of Buddha traces the various stages of the spiritual journey undertaken by a man who started out as Siddhartha the Seeker, achieved understanding as Shakyamuni the Sage and attained supremacy as Tathagata the Master-finally reaching transcendence as Jina the Victor when he was transformed into the Buddha and became the Enlightened One. Combining personal insight with a deep understanding of Buddhist philosophy, Arundhathi Subramaniam gives the reader a sensitive and revealing portrait of the Buddha and his role in shaping and transfiguring the course of history. In this passionate and deeply felt rendition of the Buddha's life she explores his enduring impact, and affirms that though he promised no quick-fix solution to life's problems, Buddhism has remained truly democratic because it holds out the promise of self-realization for all. I think I was five, and in my uncle's house, when it first registered-an impassive, somewhat weathered, limestone image, in the archetypal Gandhara style. It was a face of extraordinary tranquility. A face that presented a stark contrast to the densely populated pantheon of Hindu gods that dominated my childhood devotional landscape. The gods I knew in my mother's puja room were a vibrant bunch, captured in states of perpetual animation: the dancing Nataraja, the playful Krishna, the devoted Hanuman, the benign Ganapati. Arrestingly idiosyncratic personalities in their own right, all of them. But somehow they seemed to be busy folk, preoccupied with activities of an external kind. None of them exuded the air of untroubled interiority that this limestone figure did. I mulled over the image in the inarticulate manner of a five-year-old. What was he thinking about? Was he never angry? ever sad? Above all, never bored? Was it actually possible to be so immersed in some world inside the self? And so, without knowing it, my fascination with the Buddha had begun. The Amar Chitra Katha comic that I stumbled on sometime later, offered a life-story, but of a schemati sort. It only endorsed the impression I already had-c a compelling but puzzling inwardness. In my teens, rediscovered the Buddha through other channel: through S. Radhakrishnan and Hermann Hesse, Alan Watts and Christmas Humphreys. He remained an inspirational figure, but for other reasons. He appealed now as the heroic solitary seeker who blazed his own trail; the man who asked the same questions that I did but dared to devote his entire life to addressing them. But most importantly, here was a sage who didn’t patronize me. He didn't tell me that he belonged to the hallowed echelons of the spiritual elect. He didn't smile down beatifically from some rarefied stratosphere. Here was someone who didn't demand weak-kneed veneration He seemed to be comfortable with equality. We could be friends, I thought (with some impunity, forgivable perhaps in a seventeen-year-old). If you met him on the road, went the famous Zen epigram (that I, like many others, found so enticing), kill him. Here at last, I felt was someone who spoke my language. More than a decade-and-a-half later, I find that he still speaks it. I have approached him time and again- not as a student of philosophy or history, but as a seeker, with a seeker's mix of curiosity and desperation. He seldom lets me down. Few seem to have articulated the human predicament with quite the same degree of lucidity psychological acuity and unsentimental precision. And it is as a seeker-not as a scholar-that I approach him once again in this book.' What empowered me in what often seemed like a formidable enterprise was the man himself and his own staunch refusal to turn the existential journey into a matter for experts and cardholders. Life is dukkha, suffering, he says in a formulation that strikes you each time you read it with its chilling incontrovertibility. But it is by no means a no-exit situation. There is a way out, he reminds you, instantly challenging any notion you might begin to nurse about a creed of joyless pessimism. And here is a way that is entirely in keeping with the spiritual democrat who charted it-a way open to all. A way that does not require cosmic revelation or sacerdotal intercession. A way to a truth that is neither exclusive nor doctrinaire. A truth that is available to all who care to reach for it; a truth that knows no custodian or arbiter-nor even (and this is the great paradox of his powerful insight), a person to comprehend it. More than 2500 years ago, a thirty-five-year-old man had an insight under a peepul tree in north- eastern India. The insight was to create major shifts along the internal fault lines of generations of humanity for centuries to come. Today, over 300 million people across the globe consider themselves beneficiaries of that insight, and believe that it has irrevocably marked their spiritual commitment and identity. Today, I gaze at my flickering computer screen on a rainy July evening and I wonder at this man, my contemporary in another age. A man whose fevered meaning-of-life questions ceased one night under a full moon in May. How did they cease, even while mine show no signs of abating? Who was this man who still remains such a vital figure for the modern-day questor? 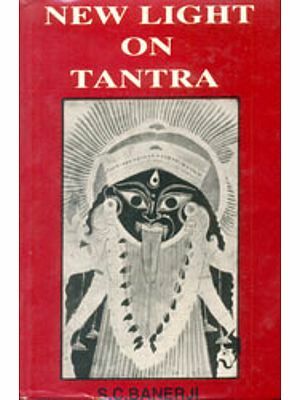 How did he arrive at the realization (brilliantly encapsulated by the scholar Buddhaghosha), the one that still boggles our minds, even while we have a subliminal hunch of its veracity: 'Suffering alone exists, but none who suffer; the deed there is, but no doer thereof; Nirvana there is, but no one seeking it; the Path there is, but none who travel it' ? In a world that grudgingly grants people their fifteen minutes in the spotlight, how does he continue to command attention across barriers of culture and chronology? How do we explain his unflagging shelf life, his dogged relevance to our lives? The pop version of the chronicle of his life has something to do with it, of course. The saga follows all the conventions of the sure-fire page-turner: Rich Kid turns Renunciant in a spellbinding riches-to-rags-to- riches success story (even if the final success can't quite be measured in material terms). But this is not just a feel-good story either. 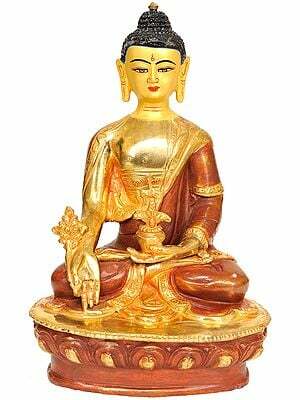 For the Buddha does not always offer succour even when we desperately feel we need it. Instead, he seems to frequently offer unsettling home truths. When Krisha Gautami approaches him, wild-eyed and disconsolate, lamenting the death of her child, he offers no token words of solace to allay her grief. Nor does he perform a miracle and bring the child back from the dead. He tells her, instead, to go around the village and bring a mustard seed from a home that hasn't experienced death. When Krisha Gautami is unable to find any such household, she has already moved from a personal grief to a deeper understanding of the endemic nature of human suffering. Could the Buddha have done it another way, I've often wondered. Surely he could have clucked over her a bit, shown more overt compassion? Perhaps. But his response in this probably apocryphal story remains typical of his strategy as a teacher, and eventually it is for this very reason that we trust him. It's futile to expect chicken soup for the soul from a man who leaves us uncertain about the very existence of the soul! What we can expect from the Buddha instead is searing insight, astringent clarity, and a wisdom we recognize even before we fully apprehend it. Why does the Buddha still speak to us? For one, I suspect it's because he seems to ask the same questions that we ask. His life-story reveals him initially as the tormented seeker, the man who cannot be satisfied with the placebos and palliatives with which the status quo habitually silences its interrogators. Questions about human suffering, the fleeting nature of pleasure, the impermanence of all that we cherish. He seems to ask these questions with the same urgency and anguish as the rest of us.